Mustard flower remedy is made from the flowers of the hairy wild mustard (Sinapsis arvensis) also known as Charlock which is very common on the edges of arable fields. It grows prolifically so we’re growing it in a tyre at Offshoots to prevent it from taking over the entire garden. When we were researching how to cultivate it, most of the websites we found talked about how to get rid of it! 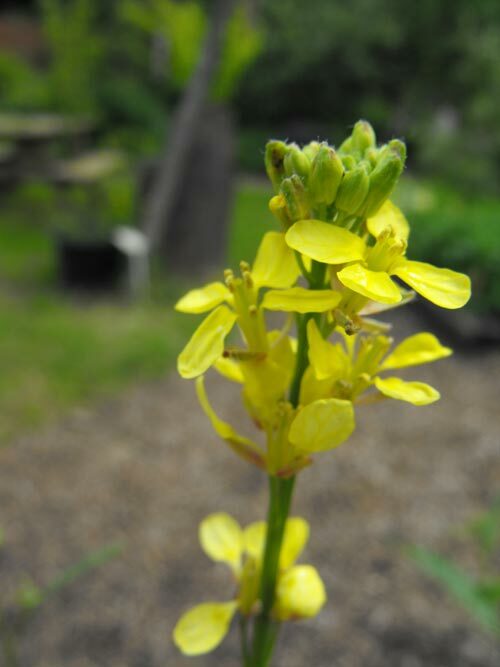 Mustard flower remedy is for feelings of depression and deep gloom for no apparent reason. If you feel melancholy, as though there’s a dark cloud hanging over your head, then mustard flower remedy will restore a sunny outlook. The leaves, stems and seeds have a long history of use as a food source for people, although it’s poisonous to some livestock.